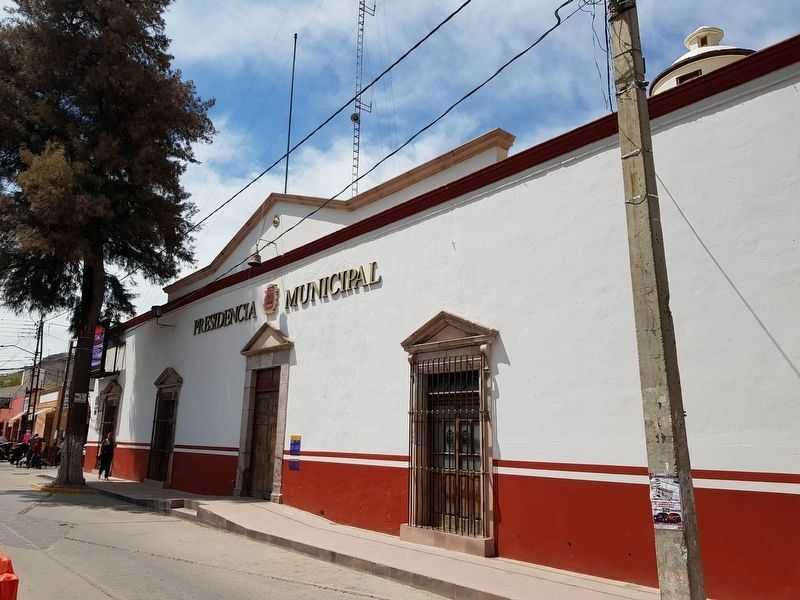 Inicialmente el Palacio Municipal se conocía con el nombre de Casas Reales, y era la vivienda del gobernante indígena. En el año de 1674 tuvo lugar la visita del Alcalde Mayor Martín de Mendalde, quien visitando los pueblos, ordenó la reedificación del inmueble. Se sabe que el edificio fue renovado durante el Porfiriato. Se adjudica su construcción a don Rafael Arias Rivera y a don Atilano Covarrubias, entonces Presidente Municipal. It was originally known by the name of Royal House and was the home of the Indian Governor. In 1674 Principal Mayor Martín de Mendalde visited this location and ordered the property be rebuilt. There is also a historical reference that it was renovated during the Porfirio Díaz period. 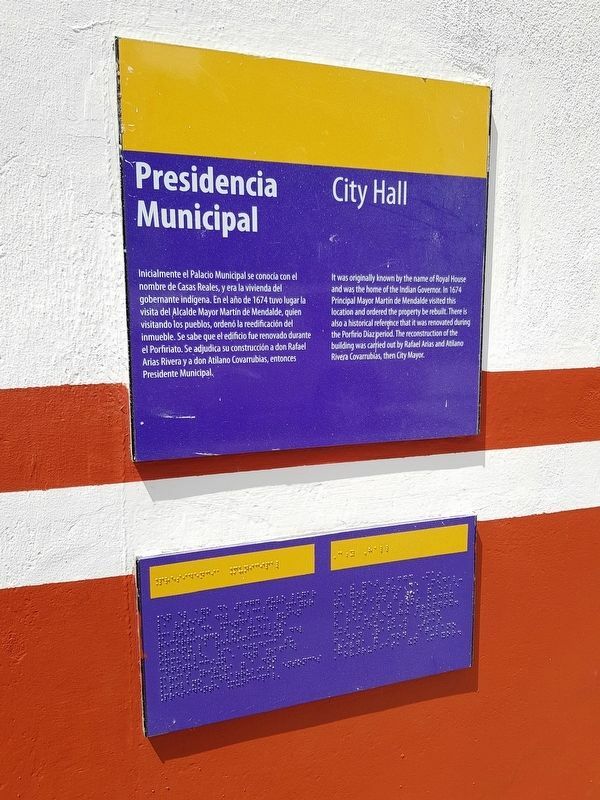 The reconstruction of the building was carried out by Rafael Arias and Atilano Rivera Covarrubias, then City Mayor. is on Miguel Hidalgo just south of Calle Pascual M. Hernández Segura, on the right when traveling south. Touch for map. Marker is in this post office area: Santa María del Río, San Luis Potosí 79560, Mexico. Touch for directions. Other nearby markers. At least 8 other markers are within walking distance of this marker. Foundation of Santa María del Río (a few steps from this marker); Primo Feliciano Velázquez Rodríguez (within shouting distance of this marker); Purísima Chapel (within shouting distance of this marker); Otomíes and Guachichiles (within shouting distance of this marker); The Parochial School of Music (within shouting distance of this marker); Tourism Office (within shouting distance of this marker); Hidalgo Garden (within shouting distance of this marker); Dividing Line Between Otomíes and Guachichiles (about 90 meters away, measured in a direct line). Touch for a list and map of all markers in Santa María del Río. Credits. This page was last revised on April 13, 2019. This page originally submitted on April 13, 2019, by J. Makali Bruton of Querétaro, Mexico. This page has been viewed 52 times since then. Photos: 1, 2. submitted on April 13, 2019, by J. Makali Bruton of Querétaro, Mexico.